Halloween candy doesn't always boost candy company share prices. Here are five examples of how tastes differ in the candy market. Halloween candy is even sweeter when you're paying yourself for each treat you eat. One of the most sound investment strategies is to sink money into the things you love. If you're a beer drinker, you could build an entire fund out of Anheuser-Busch InBev (BUD , Molson Coors (TAP - Get Report) , Constellation Brand (STZ - Get Report) , Diageo, Boston Beer Company (SAM - Get Report) and Craft Brew Alliance (BREW - Get Report) . If you love gorging yourself on chip and watching games on Sunday, buying PepsiCo (PEP - Get Report) shares for Frito Lay and AT&T (T - Get Report) shares for DirecTV Sunday Ticket isn't such a bad idea. Are you a cord-cutter sticking it to the cable and satellite companies? Give Netflix (NFLX - Get Report) , Amazon (AMZN - Get Report) and Roku (ROKU - Get Report) a hand. However, investing in candy around Halloween can be a bit tricky. Mars Incorporated is responsible for Snickers, Skittles, Twix, Three Musketeers, Dove chocolates, Milky Way and Starburst. It is also one of the largest privately held companies in the world and isn't looking for investor feedback. Just Born, the makers of Mike and Ike, Hot Tamales, Peeps and Goldberg's Peanut Chews is also privately held. If you're looking to make a dime off the folks who both love and loathe candy corn, you're out of luck unless you're an executive with privately held Ferrara, which now owns the rights to Brach's candy corn, Lemondheads, Now and Laters, Chuckles, Jujyfruit and Trolli candies. As it turns out, publicly traded candy is actually something of a rare breed in its corner of the industry. If you have a sweet tooth and want to become a shareholder in a company that feeds your fixation, you only have a handful of options to choose from. Around this time of year, in particular, that seems patently unfair. If you're resisting the urge to disconnect the doorbell, dim the lights and play dead this Halloween, chances are you'll be investing in candy of some sort. (Unless you're that weird pennies and raisins house. Don't be that house.) Since you're splurging on sugar anyway, it may be worth investing a little extra in the candy companies selling you the stuff. You may think of them as a plain chocolate company, but Hershey (HSY - Get Report) has been a pretty sweet deal for investors in the last half decade or so. The Hershey, Pa.-maker of its namesake chocolate, Kisses, Reese's, Krackel, Symphony and Mr. Goodbar has watched earnings grow over the last five years as share prices rose from $70 to nearly $106. That price has jumped from this year alone as it's paid dividends of $2.62 a share and yielded about 2.44%. 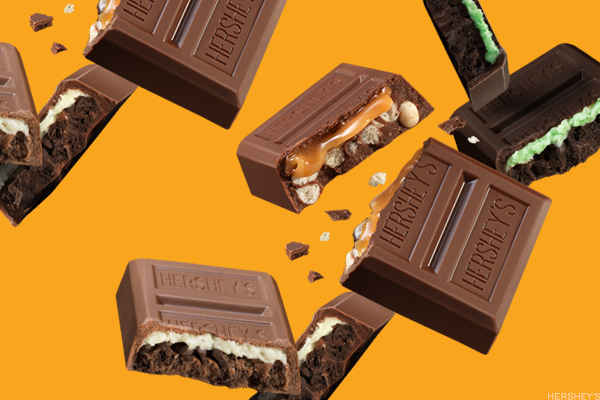 The 2008 financial crisis and 2009 market collapse had just about no effect on the share price, but that doesn't mean Hershey doesn't has problems ahead. It's been racking up debt and has a long term debt/equity ratio is nearly 350%, and its free cash flow is currently $49.9 million -- though it's been far worse. Neither issue has been a problem so far, but fattening up on this stock too much now could lead to some discomfort later. With a candy lineup that expands beyond Tootsie Rolls and Tootsie Pops to acquisitions like Charleston Chew, Dubble Bubble bubble gum Razzles, Dots, Junior Mints, and Charms Blow Pops, Tootsie Roll (TR - Get Report) is a bigger deal in the candy world than its tiny $2.3 billion market cap would suggest. The best part? It's a mom and pop shop that wants nothing to do with the investment community. After owner and CEO Melvin Gordon rans the company for roughly five decades passed away in 2015 at age 95, his 86-year-old widow took over and changed just about nothing. The couple brushed off journalists and shunned earnings calls to maintain their control of the company and avoid takeover. Gordon and her four daughters own 60% of the company, haven't produced new commercials in decades, maintain a scant social media presence and remain fiercely private. Meanwhile, its share price has grown nearly 6% in the last year and sales have nearly doubled in the last two decades with very little help from advertising. It has increased its annual dividend payment for 51 years, but it's still just 36 cents a quarter for a .98% yield. 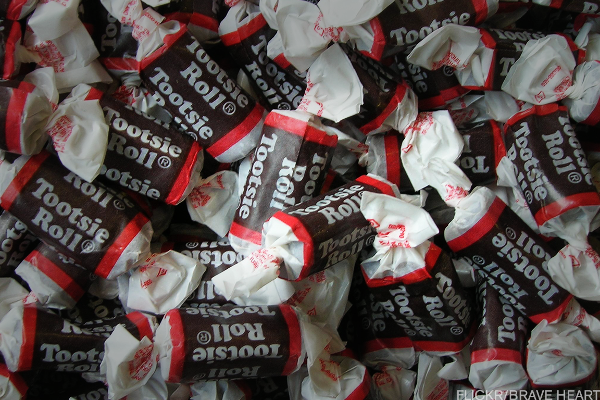 The Tootsie Roll facilities themselves are supposedly a Wonka-style wonderland of long-tenured employees and endless wax paper, but even shareholders may never see them. They're the reason U.S. Cadbury tastes bland, the reason you couldn't find U.K. Cadbury here for years and why Oreo is now everywhere. Mondelez (MDLZ - Get Report) operates globally and focuses on the snack brands Kraft acquired in the $19.5 billion Cadbury acquisition back in 2010. When Kraft Foods split off in 2012 to focus on North American grocery products, Mondelez became its own entity. Even in North America, however, Mondelez oversees candy brands like Swedish Fish, Sour Patch Kids and Toblerone. It's also watched it share price climb from roughly $27 the year it was introduced to more than $40 today. 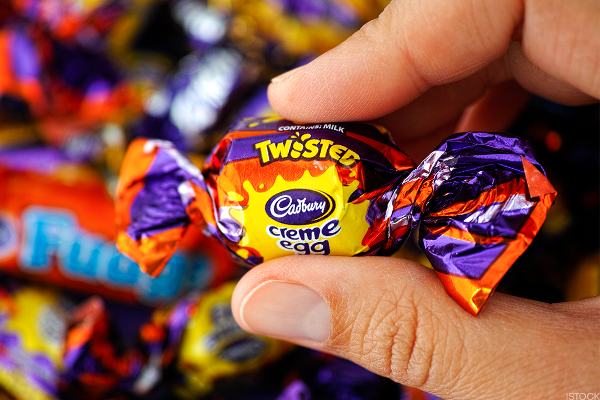 The 88-cent dividend and 2.1% yield have been lovely, but that one-year target of $50 should have investors feeling awfully optimistic, even if chocolate lovers can't quite understand the American obsession with fiddling with the Creme Egg recipe. While Nestle (VTX:NESN) isn't strictly a candy company -- with interests in pet food, bottled water, coffee, ice cream and baby food -- it's a big part of the brand's heritage. Butterfinger, Kit Kat, Baby Ruth, Crunch, Laffy Taffy, Raisinettes, Nerds, 100 Grand, Aero, Sno Caps, Sweetarts, Smarties, Fun Dip, Pixy Stix, the entire Wonka brand: It's all Nestle and it all gets a whole lot of play around this time of year. 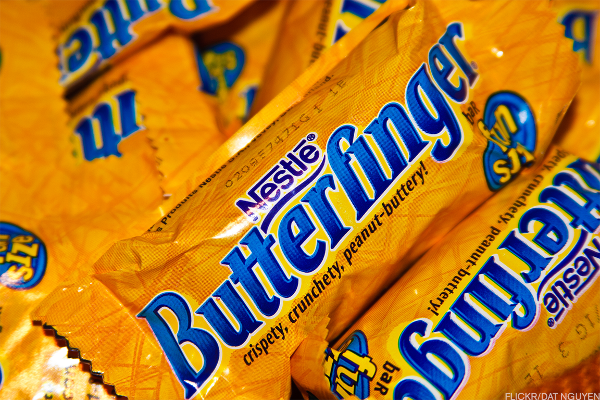 It's also helped drive Nestle shares from $63 five years ago to more than $83 today. A $2.28 dividend at 2.74% yield hasn't exactly hurt its profile among investors, either. It trades as an OTC security, but that'll happen when you're trying to invest in a Swiss company here in the U.S. However, if you walk through the candy or seasonal aisle before Halloween and feel bombarded by any of the brands above, it's just a reminder that Nestle is very good at what it does, especially when it comes to candy and chocolates. Remember what we said about investing in what you love? Forty five years ago, Warren Buffett was so taken with See's candies and chocolates that he bought the company and folded it into Berkshire Hathaway (BRK.A - Get Report) (BRK.B - Get Report) . That Berkshire Hathaway was a textile company for the majority of its existence leading up to that purchase was of no consequence. Buffett was building a multinational conglomerate that would have nothing to do with textiles a mere 13 years later. 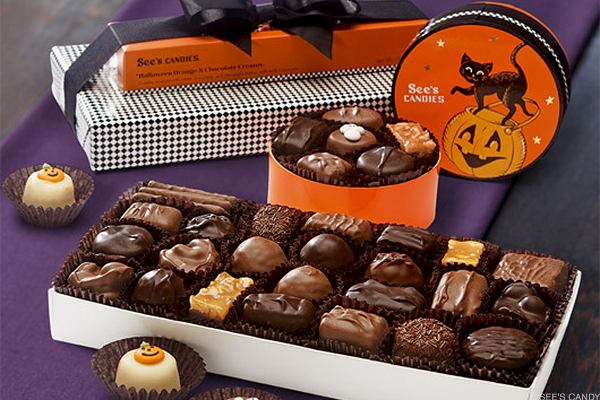 See's, meanwhile, still sells assorted chocolates, but it cranks things up during Halloween and offers orange chocolate wafers, pumpkin spice lollypops, orange twist candies and chocolate marshmallow jack o' lanterns. The stock? Oh yeah, it's doing just fine at more than $182 a share and has more than doubled its price in the last five years.